Tánaiste and Minister for Foreign Affairs Simon Coveney said that this was a “damage-limiting exercise”. Varadkar and Coveney arrive at an event to brief businesses on Brexit plans. THE IRISH GOVERNMENT has published its preparations thus far for a no-deal Brexit. The 131-page document lays out the plans under the headings: economic and fiscal; security; Northern Ireland and North-South relations; relations with Great Britain and sectoral analysis. Tánaiste and Minister for Foreign Affairs Simon Coveney said that the plan makes for a “stark” and “sobering” read, and said that this wasn’t a plan to keep things as they are, but a “damage-limiting exercise”. To prepare for Brexit, the government is buying up land at Dublin Port and Rosslare Port in anticipation of additional customs checks. It’s not expected, however, that everything will be in place at the ports in time for a no-deal scenario. In relation to aviation, Coveney said that “a skeleton arrangement” would be put in place: this would ensure that planes could fly out of British airports by maintaining the safety certification beyond 29 March on a temporary basis. Non-EU airlines flying from Britain would only be able to fly in and out, or point-to-point (this means they could fly to Paris and back to London again, but not to Paris and onto Madrid). For agriculture, a host of measures are being made for a sector that seems most susceptible to a hard or no-deal Brexit. The European Commission has suggested that there will need to be “simplified border controls” on animals and animal products travelling between the EU and the UK. In case of no-deal, every consignment of live animals and animal products coming from the UK would have to undergo, as of the withdrawal date, checks in Union border inspection posts at the point of entry into the EU. 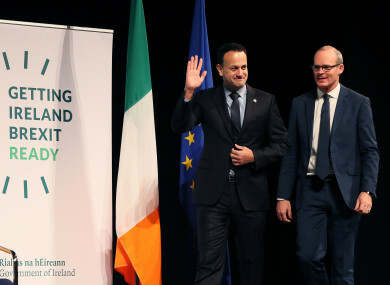 But Coveney conceded that there are no contingency plans for a border on the island of Ireland; neither are there plans to prepare fisheries for a no-deal. On security, the government fears that a no-deal Brexit would limit access to classified information and extraditions, due to the absence of the European Arrest Warrant. It’s also possible that emergency measures may need to be taken in critical areas of medicines and food supplies, but the Tánaiste affirmed that there would be no shortages of either. Coveney also said that there isn’t a “no-deal deal”, and anyone who says it is a “millennium bug” issue, in that it won’t have an impact, is fooling themselves. There is no deal that makes a ‘no-deal’ easy… If Britain leaves without a deal, it’s going to take a long time to put in place a future comprehensive trading arrangement. The reason why the deal on the table is so important, according to Coveney, is in terms of the backstop, which “does provide complex assurances to reassure people that border infrastructure will not be an unintended consequence to Brexit”. Another complication is the amount of changes to Irish law that will need to take place to prepare for a no-deal Brexit. At least 45 legislative changes would be needed, including over 20 pieces of primary legislation. In order to accomodate this in the Dáil schedule, Ministers have been asked to prioritise legislation so that it can be passed before March, as law changes relating to a no-deal Brexit would cause a backlog. The Irish government’s greatest concerns in the event of a no-deal Brexit are the difference in regulations between Ireland and the UK, a further drop in the value of sterling, and the “serious impact” it would have on security. In relation to trade, the government said that many of the same preparations needed for a “central case” scenario, or Brexit with an agreed deal, are the same for a no-deal Brexit, but those measures would have to be rolled out much faster. To date, Taoiseach Leo Varadkar had announced that they were hiring additional customs officers and vets to carry out checks at ports and airports in anticipation of Brexit, which is scheduled to take place on 29 March next year. Varadkar said that there were no plans to hire additional gardaí. In addition, the government has been encouraging and advising businesses on how to prepare for a no-deal Brexit as much as possible. A no-deal Brexit could result in a 7% drop in GDP for Ireland, while the equivalent for the UK would be a drop of 5%. Yesterday, the British Cabinet agreed to step up preparations for a no-deal Brexit, which is looking increasingly likely as the UK government and Tory party remains divided over the Irish backstop. Those plans include having 3,500 troops on standby and acquiring fridges to stockpile six-weeks worth of medicines for the NHS. Thus far, the Irish government and the EU have staunchly denied the need for no-deal Brexit preparations, saying that it could take the focus away from trying to strike a deal. But the Brexit Withdrawal Agreement looks unlikely to be passed by the House of Commons; if that does happen a no-deal Brexit is increasingly likely. Email “'A sobering read': Here's the Irish government's no-deal Brexit plan”. Feedback on “'A sobering read': Here's the Irish government's no-deal Brexit plan”.